The Father of Lies attempts to identify the slogan ‘Make America Great Again’ with hate which brings death because, in reality, it is the exact opposite; it is intimately associated with Love that brings Life. The Enemy roams about the world seeking the destruction of Life because the Life in the womb is the very Image of God who is Love. It all started with a meme (a little pictorial message that’s posted on social media created to elicit thought and discussion). Many of the initial reactions and comments to the original hat ‘meme’ were requests to purchase the hat. And, as they say, the rest is history. We contracted with a local Catholic manufacturer who delivered the first run a few days later and has kept us well supplied, and well ahead of the demand, ever since. It was the exemplary and honorable conduct of a bunch of great Catholic high school kids that inspired our PROLIFE MAGA CATHOLIC hats after the boys’ lives were turned upside down by a pack of Native American activists, with their publicity seeking leader, Nathan Phillips, manipulating a ‘fresh blood’ opportunity to acquire yet another 15 minutes of fame, and a mob of obscenity shouting, profanity baiting, racist Black Hebrew Israelites, all adult males, ganging up on a high school class of teen boys attending the 2019 March for Life in Washington D.C. (“Pick on someone your own size!” ought to have been the initial universal cry.) The boys, proudly wearing their new Make America Great Again hats purchased from a vendor at the just ended March for Life, had obediently gathered, per instructions of their school chaperones, at the foot of the Lincoln Memorial to wait for their bus. Both gangs of adult males were already present in the public square and had kept their distance from each other and respected each other’s space. Until the boys began to arrive. First the kids were mercilessly harassed and antagonized by the Black Hebrew Israelites spewing hate speech at them with all the venomous vulgarity and profanity of the devil, because of their Catholic, Pro-Life, MakeAmericaGreatAgain witness. The Native American activists then seized the opportunity to receive more free publicity after observing all the mobile phone videos recording the attack, so they moved in to join it. The boys reacted admirably, though obviously uncomfortable with the tense and volatile situation being created by the abusive adult males. But that isn’t the way it was reported. Within hours these innocent kids were brutally bloodied and beaten up by the drive-by media, Hollywood celebrities, Tweeters, bloggers, hate-filled-agenda-driven leftists commentators, and, sadly, denounced by the officials of their own faith community. But the boys are effected for the rest of their lives and will continue to pay the consequences of the harsh and unjust ‘heads on a platter’ treatment with which they were victimized. The boys were targeted. No doubt about it. The multiple mobile phone videos produced as evidence during the investigation proves it beyond any reasonable doubt. They were targeted for being: 1) Pro-Life, 2) Trump supporters, and 3) Catholic. And as Pro-Life Catholics the boys have a fearless role model in Priests For Life, Father Frank Pavone, who exemplifies heroic courage, fidelity, and fortitude on America’s shameful abortion battlefield soaked with the blood of 60 Million dead babies since Roe vs Wade. Father Pavone also proudly wears a Make America Great Again hat because for the first time in our nation’s history we have a Pro-Life President who has also come out in defense of Nick Sandmann and the other Covington Catholic High School boys with recent Tweets supporting them. 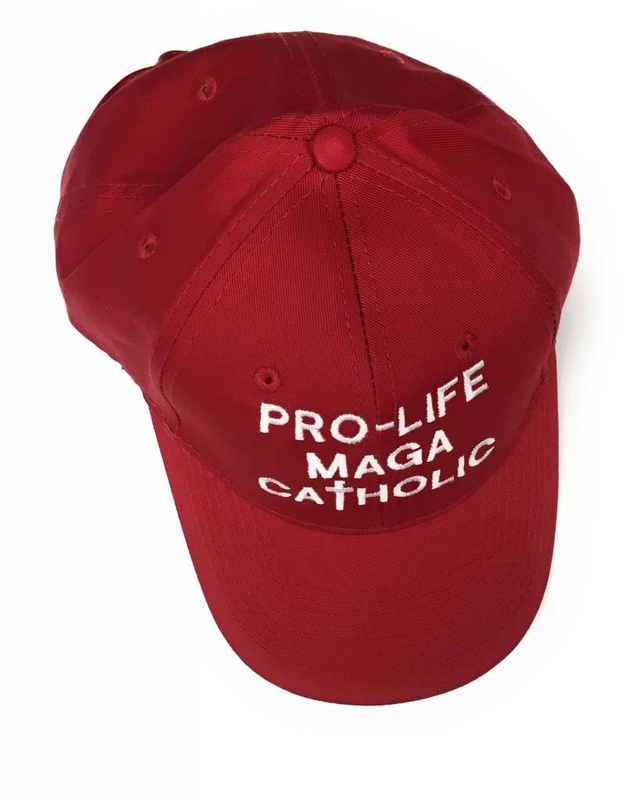 The Covington Catholic High School boys, Father Frank Pavone, President Donald Trump, and all who support, promote, and advance the Culture of Life in America are targets of the Enemy of Life with or without ‘the hat’. Vercillo’s Catholic Store fully anticipated being attacked with our PROLIFE MAGA CATHOLIC hats. What we did not anticipate was the mind-blowing amount of support we have received, from all over the world, for our hats and the good and holy ideal that they represent. As of today we are shipping out our first international bulk order. All in a month’s time from inception. It’s time to push-back on the Enemy and not be afraid to proudly, and visibly, witness to what we believe: 1) PROLIFE. That all human life, from conception to natural death, is sacred and has inestimable value in the eyes of God our Creator. 2) MAGA That our country, America, can only be great again when she returns to the Judeo-Christian ideals of our founding fathers as established in our Constitution and Bill of Rights, including the Right to Life. 3) CATHOLIC. That we are to be a light set on a mountain top and not hidden under a bushel basket. To this end we proudly tip our hats!